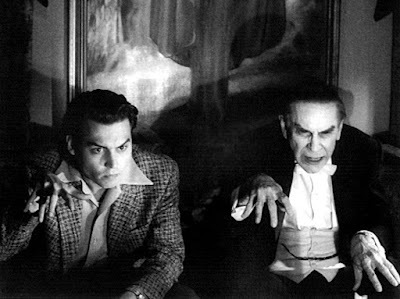 Actor Martin Landau died this past weekend at age 89. 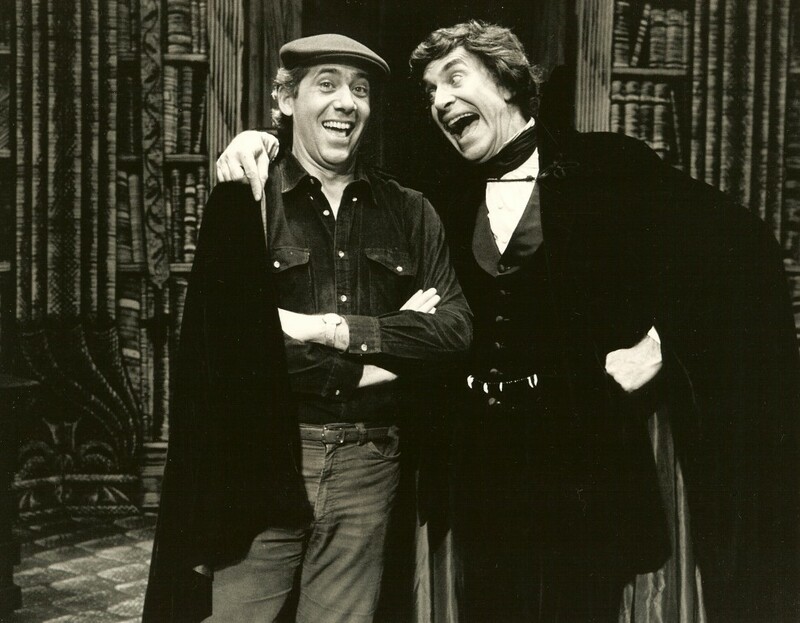 Mr. Landau played many roles over his long career including the title character in the 1985/85 national tour of the stage revival of Dracula. 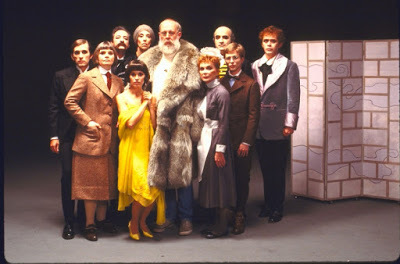 The tour featured the sets and costumes by Edward Gorey, and I was pleased to attend both performances of the play when it stopped at the Ordway Theater, St. Paul, MN in February 1985. Ten years later, Mr. Landau would once again inhabit the signature cape, earning a Best Supporting Actor Oscar for his portrayal of Bela Lugosi in the film Ed Wood. 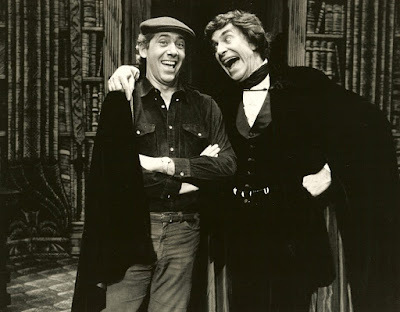 An article about the casting of Landau in the 1984 theatrical revival can be read HERE. 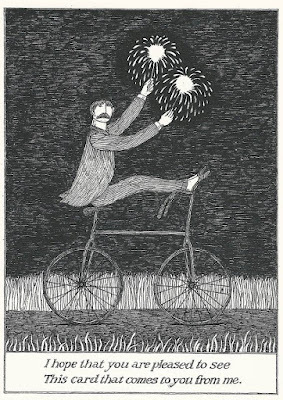 Over the years Edward Gorey adapted his books into "an entertainment with music" several times with mixed success. Gorey Stories was the short lived Broadway production which opened and closed on October 30, 1978. 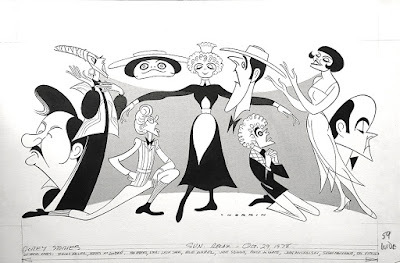 The show was later retooled as Tinned Lettuce (NYU student production 1983), Amphigorey (Off Broadway 1994), and The Gorey Details (Off Broadway 2000). Some of the original artwork used for set and program designs from the later production has appeared at auction in recent years. Mr. Gorey's original artwork for the Playbill cover for Gorey Stories was sold at Swann Auction Galleries in January 2016. An interesting piece of original artwork by caricaturist Sam Norkin related to Gorey Stories recently surfaced. Mr. Norkin (1917 - 2011) was a New York born cartoonist who spent his long career producing caricatures for newspaper theatrical reviews. Known as "The Other Hirshfeld", Mr. Norkin's drawings graced the pages of the New York Herald Tribune from 1940 - 1956, after which he worked primarily for the New York Daily News. Mr. Norkin also wrote for newspapers as a theatrical reviewer. Mr. Norkin created artwork to illustrate reviews for shows playing on Broadway, Off-Broadway and for out of town try-outs. His body of work has recently been offered over the course of several auctions and the shows represent a full spectrum of New York plays and musicals. One piece that caught my eye was created for Gorey Stories. I have acquired the piece, but as yet have not been able to ascertain if it actually appeared alongside a newspaper review. Several reviews of the show did appear in various New York papers, but so far I have only seen photographic illustrations accompanying them.